Ihave to give Mrs. Dan credit for finding it. She was looking for the cheap Walmart version of Takis (costs 99 cents compared to 2 or 3 bucks) to keep Mr. Ben happy with his school lunch. If you don’t know what Takis are asking your kid. If you don’t have a kid then think of them as Fritos Twists but rolled into little tubes then dusted with some red stuff that is not of this world and hot as hell. Think of the same orange residue you get on your fingers with Cheetos but turn it red. Stains your shirt just the same. They are hot, in two ways. Kids love them and are all the rage (healthier than the Tide Pod challenge) and they are super hot. Don’t eat them without water nearby. They are made in Mexico so hopefully Trump won’t put tariffs on them. I digress. 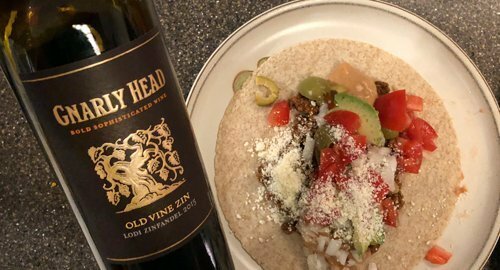 So she found the Gnarly Head Old Vine Zin for around $8.99 a bottle. We had some last weekend so I stopped by and bought 2 more bottles this week. We enjoyed one tonight with some tortillas. I had taken Mrs. Dan too seriously when she said that Bi-Lo has a great price on some hamburger meat and thought I empress her and buy some. The problem was the smallest package was about 2-1/2 lbs and we didn’t have room to freeze any of it. So we cooked up a hug vat of taco meat that we nibbled on for a week. Tonight we used it for Tacos. I opened the Zin and I really like it especially at under $10. This is not a sophisticated Zin. It is approaching jammy, something I don’t taste much in zins. I detected sweet cherries with some dark plums tossed in. Kinda like a old vin zin can potentially be. I doubt any oak hit this wine. Nice mouthfeel. I checked their website and they describe it as ‘Rich, dark berry flavors with layers of spice, plum, pepper and vanilla.” Okay, I can say there was a hint of vanilla. The spices in the taco meat seem to make it sparkle a bit, bringing out those pepper flavors they talked about. I’m glad I bought two bottles. I hope they are on sale next time I drop by. I am glad to see the 2015 vintages coming in. For a while it seems like everything was the 2012 vintage and I wasn’t over impressed with 2012. Seems like 2013 and 2014 didn’t even happen. But more and more I see 2015.